Win a share of $20k cash! CGU is teaming up with Nova to celebrate all the hard working, ambitious business owners across Australia who might be missing out on a Christmas party. Enter below for your chance to win a double pass to the party of the year, hosted by Nova’s own Wippa. 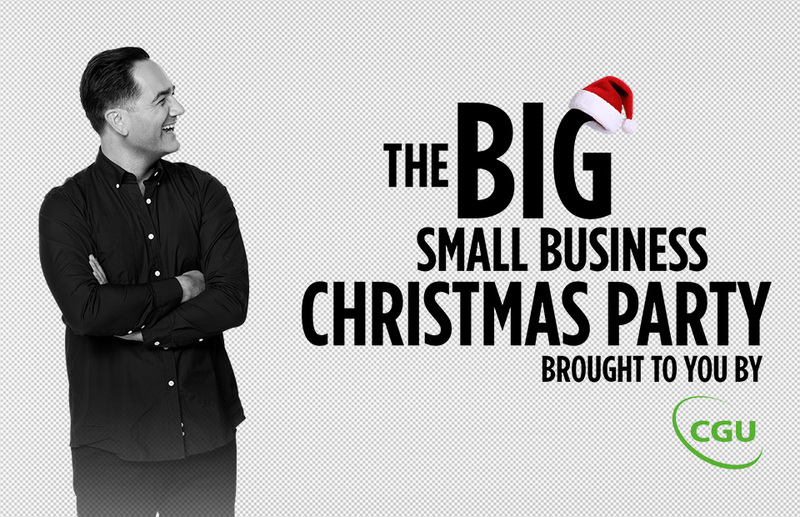 There will be an opportunity to connect with other small biz owners, hear from some industry experts and have the SMErry Xmas experience you’ve always wanted. Just tell us your business Christmas wish in 25 words or less and you could go into the draw to have your business wish granted and win a share in 20k cash. On the night you could also go into the draw to win an advertising package from Facebook, TRIBE or Nova….worth up to 15k to help get your business noticed! This event is powered by small businesses and backed by CGU Insurance. Because CGU makes ambitions happen. Wishing you a SMErry Xmas! During the Promotion Period entrants must complete the online entry form and register their details in the manner required on the Website and answer in 25 words or less the question: “What is your Christmas wish for your business?”. The Promoter will select the ‘best’ three (3) online entries from all valid entrants who will each be awarded a ‘Shortlisted Contestant Minor Prize’ (Shortlisted Contestants) and invited to participate in the CGU Small Business Big Christmas Party event in NSW on Monday 10 December 2018 (Event). The Promoter will then select the ‘best’ ninety-seven (97) runner-up online entries from all valid entrants whose relevant state is NSW and each will be awarded a ‘NSW Event Invite Minor Prize’. The three (3) Shortlisted Contestants must be available to be filmed between Monday 3 December 2018 and Monday 10 December 2018 (timing at the Promoter’s sole and absolute discretion). The Shortlisted Contestants will be required to feature in a short video, up to 5 minutes in length and participate in a live Q&A session at the Event. Following this the crowd at the Event will participate in voting for their favourite Shortlisted Contestant. At the completion of voting the votes will be counted and the Shortlisted Contestant with the highest number of votes will receive Major Prize 1. The remaining two (2) Shortlisted Contestant will be awarded Major Prize 2. All valid entries received during the Promotion Period will be individually judged by representatives of the Promoter based on the Judging Criteria. Entrants and their companions must be able to attend the CGU Small Business Big Christmas Party (The Event) on Monday 10 December 2018 between 6:00pm AEDT and 10:00pm AEDT. Dates and schedules of The Event are not under the Promoter’s control and are subject to change. The Promoter takes no responsibility for any date or schedule changes. All valid entries will be individually judged by representatives of the Promoter (in the Promoter’s sole and absolute discretion) by 5:00PM AEDT Tuesday 4 December 2018 at the Promoter’s premises. All valid entries will be judged based on the Judging Criteria. • One (1) x invitation for the winner and their companion to attend the CGU Small Business Big Christmas Party on Monday 10 December 2018 in Sydney, NSW between 6:00pm AEDT and 11pm AEDT. Each prize is valued up to $100 (incl GST). • Shortlisted as a Contestant for the Major Prize Voting contest at The Event and the chance to win a Major Prize. • One (1) x Domestic Travel Prize for the winner and one (1) companion (companion must also be aged 18 years or older, to be determined by the prize winner and approved by the Promoter in its absolute and sole discretion) to Sydney for two (2) nights during the period Sunday 9 December 2018 and Tuesday 11 December 2018 (inclusive). o $200 AUD spending money to be electronically transferred to the winner’s Australian bank account. For the avoidance of doubt, if a prize winner’s ordinary state of residence is NSW, they will not be awarded a Domestic Travel Prize. For entrants whose ordinary state of residence is either VIC, QLD, SA or WA (as determined by the Promoter in its sole and absolute discretion) they will be awarded a Domestic Travel Prize. The prize is valued up to $15,000 (incl GST). There will be one (1) prize to be won comprising of $10,000 AUD (incl GST). There will be two (2) prizes to be won comprising of $5,000 AUD (incl GST) each. Up to $39,700 (incl GST). The prize will be emailed to the winner's nominated email address by the Promoter or prize provider of the Promotion. The winner's (and their companion/s, if applicable) name will be on the guest list at the event. The prize will be transferred to the winner's nominated bank account via electronic funds transfer (or the nominated bank account of the winner's parent/guardian if the winner is under 18 years of age).